January 1, 2015 marks the 45th anniversary of the amalgamation of the cities of Port Arthur and Fort William along with the geographic townships of Neebing and McIntyre. To celebrate this anniversary, we’ve dusted off some songs to amalgamate by from the City of Thunder Bay archives. 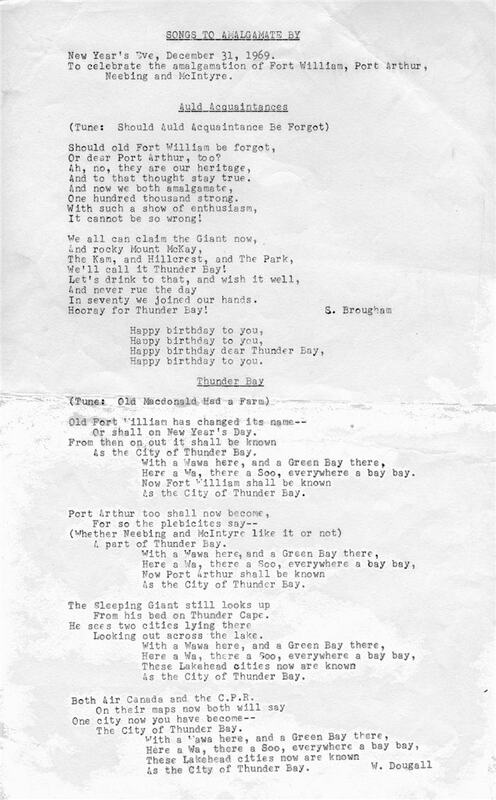 Thanks to the creative minds of S. Brougham and W. Dougall for writing the lyrics and to the Thunder Bay Museum/City of Thunder Bay for hanging onto them for 45 years!